Moving to Connecticut - Compare International Movers & Save up to 70% ! Save yourself the stress of chasing around and searching the internet for the right company to help you with Moving to Connecticut, USA. 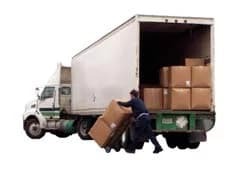 You can quickly and easily request up to six quotes from reputable moving companies using Intlmovers for your move to or from Connecticut. The service is completely free and you are under no obligation to accept any of the moving quotes that you receive. When you receive your quote responses it is important that you compare more than just the total price. There are often different services included in the price so it is important that you are comparing like for like. Find the company that offers all the services that you need for your international move to Connecticut and be sure that you get the best value. It is always useful to include as much detail as possible that will help provide an accurate quote. If you have a piano or an antique clock that needs special attention, this may have an impact on the way the move has to be handled. If you inform the moving companies up front of any special needs, this will help avoid any confusion or last minute surprises to your final price for your international move to Connecticut. Planning an international move to the USA, means that will need to check that you have the correct paperwork. The Visa Waiver Program that is in the USA has 36 participating countries. If you have citizenship from any of the following countries, you are eligible to stay in the USA without the need of a visa for a period of up to 90 days. The countries are Australia, New Zealand, Singapore, and a number of European countries. If you are from Canada or Mexico and travelling with a valid passport, the USA had a different set of regulations in regards to your stay in the USA. There are a number of different types of visas for living in the USA. The type of visa that you need depends on your reason for being in the USA. Some of the examples are: being married to a US citizen and travelling under an employer sponsorship. Additionally, there are special visas for students, professional athletes, artists and performers. Regardless of where you are travelling to and from, it is always a good idea to first check with your local authorities for the specific rules that apply to your personal situation. Connecticut is one of the states that make up the New England area on the north east coast of the USA, and is one of the smallest states in the country. That said, the population density of Connecticut is actually the fourth highest in the USA. Unemployment in the state varies between smaller towns and the main cities of Bridgeport (the state capital), New Haven, Hartford and Stamford. The major industries of Connecticut include transportation equipment and agriculture. Aircraft is a prominent industry, and has an official state aircraft. Tourism and the arts contribute a great deal to the state economy and the availability of employment opportunities. The median household income in Connecticut is $68,500, which is one of the highest in the country. However, there is broad spectrum of salaries that make up this spectrum. The price of real estate varies considerably across the regions, depending on where you live and the type of housing you have. The median price is $226,000, yet Connecticut is considered the second most expensive state after California. It has the most number of homes priced over one million dollars in the north east area. Inside the borders of Connecticut, residents experience a humid continental climate whereas the coastal areas experience a humid subtropical climate. Winters are generally cold, with average temperatures in January around 38°F (3°C) in maritime influenced areas, to 29°F (-2°C) for further inland areas of the state. Snowfall averages are recorded as between 54 and 18 9cm per year across the area. Summers are considered hot and humid with average temperatures of around 81°F (27°C). Thunderstorms occur quite frequently during the summer months, with an average of around 30 per year. The moving companies on Intlmovers are professionals, who often offer specialization in specific services or fields. If you are moving from Connecticut you can request free moving quotes from the best international moving companies from Connecticut.